When one examines playwright and screenwriter John Logan’s filmography, it’s difficult to believe that these very different screenplays all came from one person. The subject matter of his scripts includes everything from an epic football season (Any Given Sunday) to a fierce battle between Japanese warriors (The Last Samurai) to an animated Western about a freewheeling chameleon turned cowpoke (Rango). His next film, Hugo, is a whimsical tale about an orphan who lives in the walls of a Paris train station. Directed by Martin Scorsese, Hugo will be released on November 23. Logan, who says he is heavily influenced by Shakespeare, moves easily between drama and comedy and between stage and screen. He has gained great acclaim in each genre and venue, winning a Best Play Tony Award for Red and receiving two Best Original Screenplay Oscar nominations for The Aviator and Gladiator. In addition, Sweeney Todd: The Demon Barber of Fleet Street, for which he wrote the screenplay, won the Golden Globe for Best Motion Picture—Musical or Comedy. Logan spoke with TriQuarterly Online about how he approaches, researches, and writes about a diverse range of topics. TriQuarterly Online: Your writing covers so many different topics. Is there a common thread that connects all your work? John Logan: Yes and no. In a way, I’m always drawn toward big characters and the exciting, theatrical idea. Complex, dark characters appeal to me. I like to tackle topics that I don’t understand. Whether it’s Mark Rothko on stage [in Red] or Leopold and Loeb [in Never a Sinner] on stage or Sweeney Todd or Howard Hughes [in The Aviator], I’m drawn toward dark, big characters. I don’t tend to write naturalism. I tend to write more stylized or heightened worlds because that’s what appeals to me. So that’s a unifying element. I’m always drawn to characters that I think are linguistically interesting, that have an interesting way of expressing themselves orally, because my job is writing lines for actors to speak. But the other part of the answer is: not really. The American dramatist I admire most is Eugene O’Neill. He wrote The Hairy Ape, Ah, Wilderness!, and Long Day’s Journey into Night. It seems inconceivable that the same person wrote all of those. But what O’Neill did was challenge himself to write in different forms and different voices that all had inherent, organic truth. So I seek out things that are new and unlike things I’ve written before. TQO: Once you start a project and you’re a few pages in, how do you know that you’re going in the right direction? JL: If I’m inspired to keep writing—if whatever I’m doing is provocative or entertaining or amusing enough that I want to know what happens next; if the characters are in some way surprising me; if they are fulfilling my expectations or surmounting my expectations, then I’ll keep writing. The work of a playwright or screenwriter is very specialized. I don’t write prose. I couldn’t write a novel. I don’t write nonfiction. I couldn’t write a nonfiction account of this conversation to save my life, because that’s not what I do. I do a very specific thing, which is to write lines for actors and find ways to inspire my collaborators on stage or in movies to do work. TQO: What can you do with writing drama that you can’t do with prose? JL: Theater is very immediate. It’s temporal. The curtain comes up, you tell the story, the audience sits there for ninety minutes or two hours. Then the curtain comes down, and it’s over. You’ve done all your work in a great sprint, whereas for me, reading a novel is like a marathon. The novel is a more contemplative, evocative form. You invest over a longer period of time with it. Drama, either movies or theater, is about the immediate spark with the audience. It’s the immediate engagement between characters. I see it as one step more personal. To be in front of an audience is ferociously open and brave. TQO: When you find a subject that interests you, do you find it naturally lends itself to either a play or a movie? JL: Yes. Usually it’s something in my bones. I have a sense of which medium it belongs in. Red, for example—I knew instantly it was a play. I knew it was a two-character play. It seemed like the right way to tell that story. A movie has a different vocabulary and way of storytelling. Certain characters and stories might lend themselves more to that experience. But it’s not a cerebral process. It’s very much an instinctive, emotional, gut response. TQO: When you write about historical figures like Howard Hughes or Mark Rothko, how do you do your research? JL: For me, it’s like dropping a stone in a pool. It starts very primary, with the straightforward things you’d imagine, like all the histories or all the biographies. Then the ripples spread out with research. For Red, for example, I started reading biographies of Mark Rothko. Then I read Mark Rothko’s writing. Then the ripples went out a little further, and I read about art. I studied art. Then the ripples went out further, and I read about what it was like to live in New York in 1959 and 1960. So gradually it becomes attenuated from the core of the idea, but it’s all relevant. Research is a total immersion for me. And I know when I’m done when it achieves a critical mass. Suddenly a switch is flicked and the lights go on, and I say “Aha! That’s it.” Then I know I don’t need to research anymore. I never know how long it’s going to take. Sometimes it can be easy, and sometimes it can be a laborious process where I still don’t feel like I have what I need but I’m forced into writing. TQO: In 2002 you wrote Star Trek Nemesis, and now you’re working on the next James Bond movie, Bond 23. What is it like to work on a series in which other people have written the previous movies? JL: It’s like being a part of an ongoing story. I grew up on the Bond movies, and I remember the first one I saw. I remember seeing other ones over the years. They are part of my life story. Same with the Star Trek characters: they’ve been a part of my life for years. So to get to go in and help shape that ongoing journey is thrilling. TQO: Is there any pressure? JL: There is a unique sense of responsibility to it. The audience comes with a certain level of expectation and a certain investment and familiarity with the characters. So you want to treat the audience really well. TQO: I’ve heard you say before that every time you write something, you imagine it will be a hit. Where does that confidence come from? JL: I have a lot of support. I have a lot of people who believed in me early on and gave me validation for my work—first teachers and then theater professionals. Even if they didn’t love all my work as a playwright, they were always very supportive of the idea of my becoming a playwright, and they understood that I was trying to find my way as a playwright. When you have colleagues by your side whom you respect and who believe in your work, it helps you feel a sense of pride in your work. TQO: What drives you to write and keeps you going? JL: It’s the only world I want to be a part of. It’s all I can do. It’s what I was born to do. I know that sounds like a superficial answer, but I feel like I was born to be a dramatist. From the minute I sat down to write my first play until today, I’ve only wanted to do one thing, which is exactly what I’m doing now. 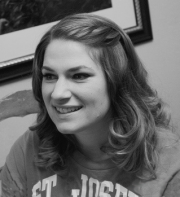 Amanda Morris is the managing editor of issue 141 of TriQuarterly Online and a former nonfiction reader. She is a science writer and publications editor in Northwestern University’s Office for Research. She has a bachelor's degree in journalism from the University of Illinois where she received the Bill Geist Award for Broadcast Journalism in 2002. She is now pursuing an MA in creative nonfiction at Northwestern.